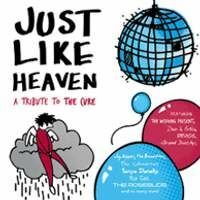 American Laundromat Records are streaming all the tracks from their upcoming tribute album to The Cure "Just Like Heaven". Dean & Britta cover Friday I'm in Love and the album also features contributions from The Wedding Present, Tanya Donnelly and Elk City. To hear the whole album you can head over to the American Laundromat's web page and launch their radio player or you can go straight to the player using this link. The album will be released to shops early next year but the label is taking pre-orders now at their online shop, which will be posted out before xmas.